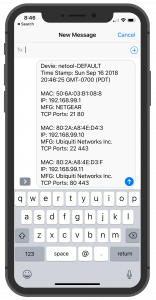 Arp scan is a tool specifically designed to scan network with layer 2 or mac or Ethernet arp packets. Navigate to Settings (sprocket icon), then toggle switches and then turn on Auto Arp Scan. 2. Go back to main screen and plug your netool into an active ethernet port. 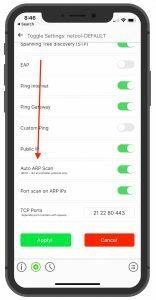 Before your netool will Arp scan the network that it is plugged into, the netool must have ether a DHCP ip address or a static IP address. 3. On the main menu, once your netool starts detecting hosts, an icon will appear on the main screen indicating how many hosts the netool has found. 4. You can now ether tap on the Arp scan result icon or go to settings, then arp scan to see the arp scan results. 5. You can also share the arp scan data just like you could the main screen discovery data.